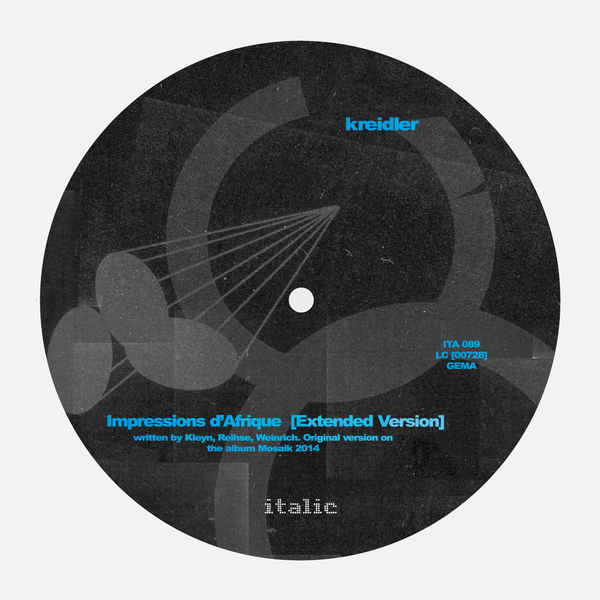 The ever-intriguing Kreidler reurn to Italic with a single version of 'Impressions d'Afrique' from their 'Mosaic 24' album, backed with a Krautrocking disco mix. The original album version is firstly given an extended makeover, grooving deeper into the tribal drum patterns and giving the cold-wavey synths longer to unfurl. In remixed form, 'Impressions d'Afrique' becomes a serious cosmic groover, revolving around simple bassline arpeggiations and wicked slow 80s drum machines to sound like something from the Moxie series or a Danielle Baldelli set. Ace.